ULTRA FAST CHARGING AND DATA TRANSFER – Designed with 22AWG Thick Copper Wire, Amkette ToughPro cables delivers ultra-fast data transfer and charging with maximum current output, up to 3 Amperes. Also, the cable is compatible with Qualcomm QC Technology. (Please note, to use QC charging along with the cable, a QC compatible Charger/Adapter is required). BUILT TO LAST – Amkette ToughPro cables combined with, Kevlar Reinforced thick copper wire and high thread count micro mesh braiding, offers you ultimate durability. Unibody Flexible Joints add extra protection towards daily wear and tear of the cable. EXTRA LONG WITH VELCRO TAPE – For hard to reach places, Amkette ToughPro cables are 1.5m long. The longer cable lets not to worry about the position of the charging socket. Also, attached velcro tape ensures that you can manage your cable better while using for the shorter distance. THE AMKETTE ADVANTAGE – HASSLE FREE 2 YEARS WARRANTY from a company that has valued customer for over 30 years. For any assistance, you can always call our customer care number 1800-11-9090 or WhatsApp on 9312691448. Amkette Tough Pro Charge and Sync cables are perfectly engineered to meet the most demanding daily use. At 1.5 Meters long, this cable ensures to maximum flexibility on your desk, your couch or bed. Super Strength Fibers – Tough Pro cables are reinforced with Aramid Fibre. That’s what is used in Bulletproof Vests. Micro Mesh Braiding with a very High Thread Count ensures maximum durability. Unibody connectors add a strong layer of protection against the daily wear and tear. Oxygen Free Copper Wires ensures you get the fastest charging possible. These Cables are designed to last. With 10,000+ bend tests, Amkette Tough Pro cables can last up to 10x longer than conventional cables. While other braided cables start fraying, and tearing, this high thread count fabric cable will last and last. 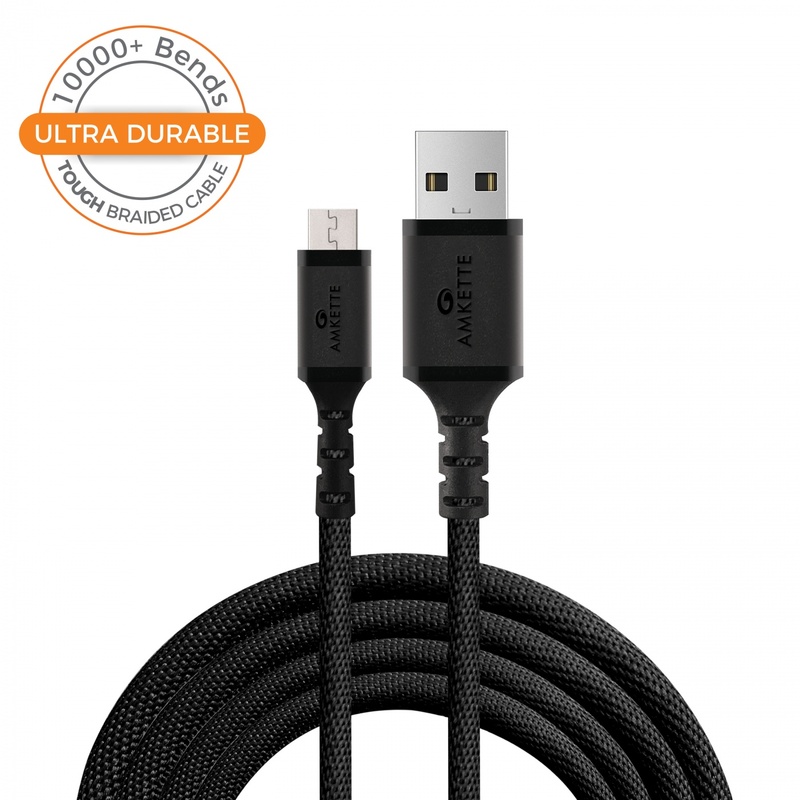 Amkette cables are built with sturdy and strong unibody connectors to offer maximum durability and life. Reinforced cable joints maximize the durability of the cable. Strong Aramid fibers make sure the cable won’t break in the middle. While we don’t recommend using this as a rope, it could do the job. These cables come with a layer of Aluminium Shielding. This protect the data transfer from any outside electro magnetic interferences. Small bits can go a long way. While it’s not wireless charging, the 1.5m is long enough to be provide ample flexibility. With the bundled Cable Organiser the cable can be as short as needed.